We pay taxes and make Government accountable for work. Govt allocate budgets, make some policies and think that bureaucrats will implement. Then where things get failed. Lets take one example. Each Village gets budget in crore per annum for development. Policy is that there will be one Gram Panchayat head “Pradhan”/”Sarpanch” elected by people and there will be around 11-13 other elected members (depending on number of wards) to pass any proposal and one will be Govt servant called Secretary. Policy is that there should be regular open meeting in each villages and any proposal should be finalized when majority of the members passed that proposal. Now where is the problem? Lets go more deeper. In most of the villages, elected Gram Panchayat “Pradhan” manipulate these members. Most of these members are uneducated, poor and elected from each ward of the villages. It is always easy to influence them by making one or two offers, e.g. one solar light, handpump, underground drainage etc. Open Meeting are never called in villages but always maintained on register for showing to senior district officers, RTI reply etc. Then what? Then the all problem goes on and on. Every five years, new Government elected but poor farmer & villagers suffer more or less in same manner. Budget comes to the villages, sometime half of the budget might be used also with low quality work but mostly it gets distributed from Village Pradhan, Secretary and higher officers (and sometime local politicians also take commission on certain tender/contracts). Lets move to the positive side. We as a FARF organization, adopted few villages to start rural development work. In all village, we demanded that open meetings are not happening and it should be done. First reply we got from authority that meetings are happenings on timely manner and recorded in register. We again asked for the details of meetings (details, timing, proposals etc) and also asked why not the budget/expenditure has been displayed on public places as per rule. Later, meeting was scheduled in one of the adopted village called “Bhikharirampur”. Meeting was cancelled because no villagers were informed but since our FARF team members were there in the meeting, it was rescheduled again. Second time, same thing happened again. 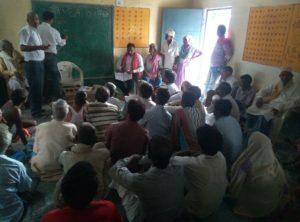 Meeting rescheduled again for third time,This team, our team member took the responsibility to inform everyone in the village. Finally, we made one such history and successfully organized one open meeting on 9th October, 2017. Meeting was so successful that all participants told us that such meeting never happened in their village. Long way to go! India cannot change without rural development and Rural Development cannot happened without our contribution as a responsible citizen. Excellent thought process and efforts taken towards one of the most important draw back of our country. I think the greatest enemy is illiteracy rate & unawareness along with population explosion for un-developement of our rural areas. There is a urgent need to focus on these areas too. Thank you Bhaiya for your feedback. Good write up and congratulations to you and your team for hard work. I hope this will going to sustain for the long term. I was expecting few lines on the outcome of the meeting as it included in the blog that “Meeting was so successful that all participants told us that such meeting never happened in their village”.